Yes, that was the begining of the watches’ revival which ended not so long ago. 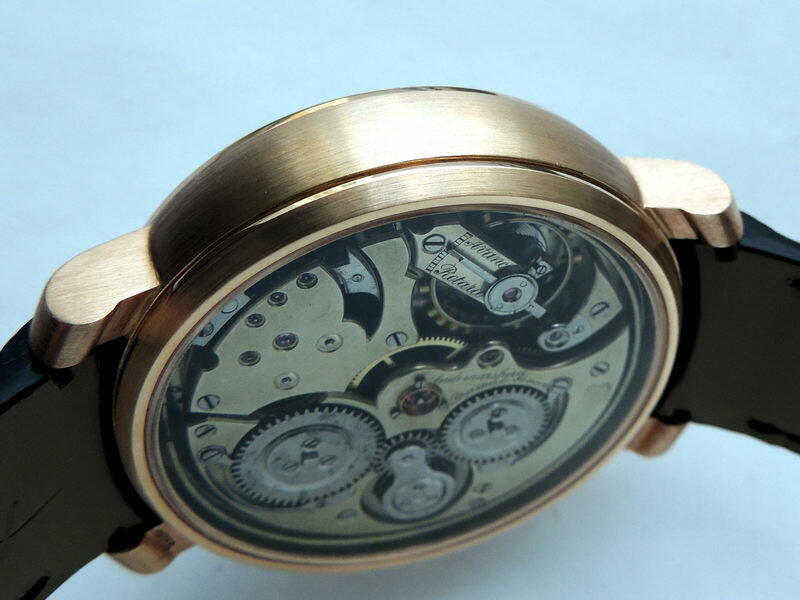 The recreation started from just a plan to position the movement in a newly-made gold case. 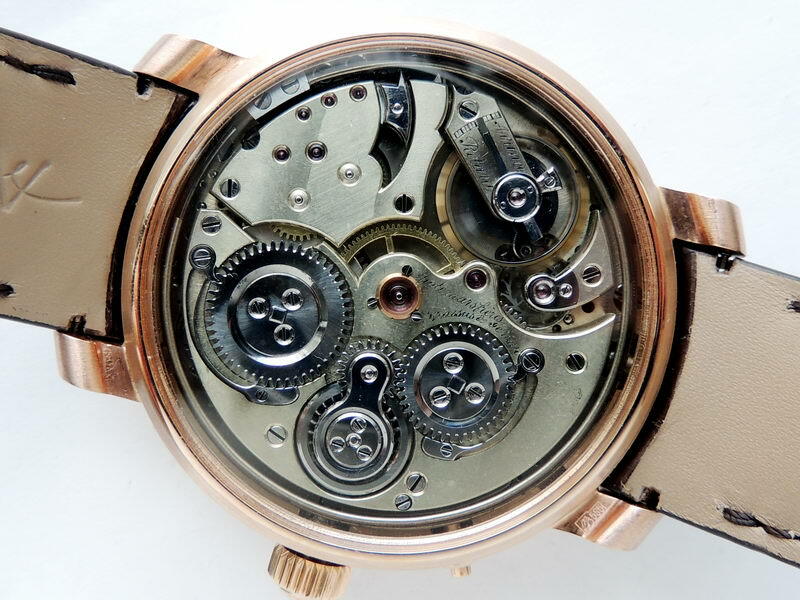 The thing is, that because we wanted to not only literally insert it into a case, but also make a beautiful watch, to find it a pleasure to look at. How is this movement so unique? The big thing is a function called the Petite Sonnerie. 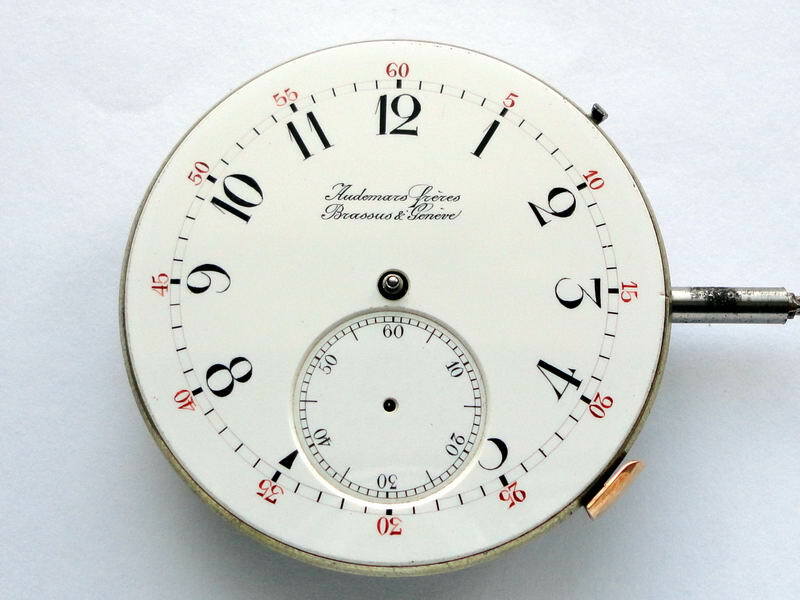 Not a classic repeater, but an automatic one, self-striking chimes. 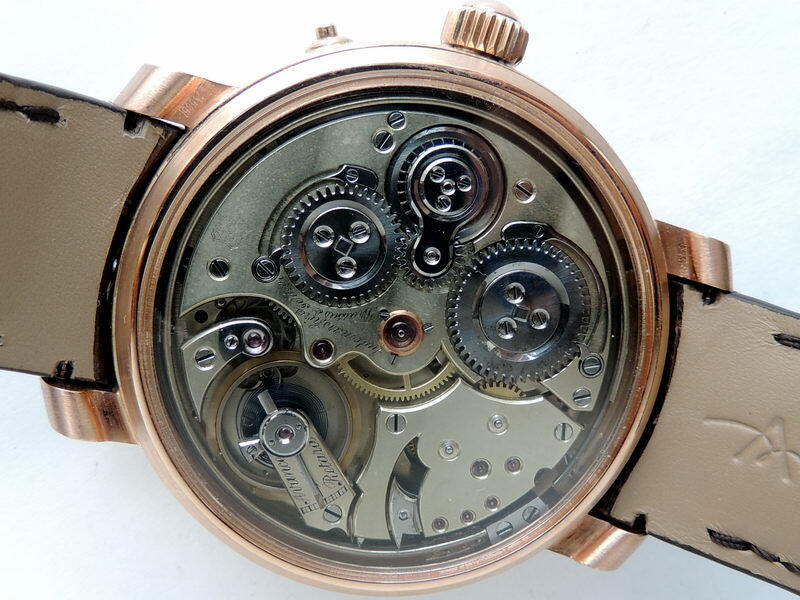 The second rare feature is that the movement is not dual-gong, but triple-gong one with three hammers. This feature is referred to as Carillon. 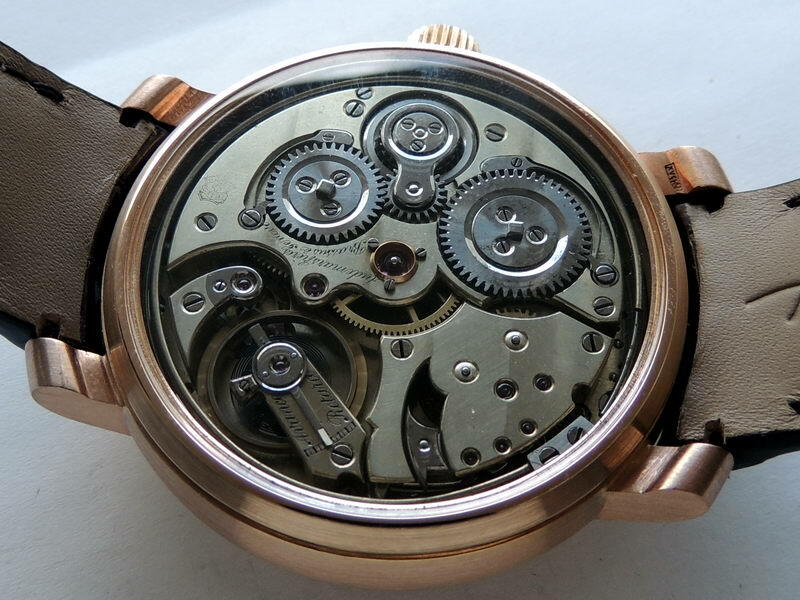 The mechanism has two barrels – for the movement and for the gongs. The movement is wound up by one crown, which is spun both ways, the clockwise winds up the movement and the anticlockwise winds the gongs. The three gongs consist of the total of three hammers, each sounds different! 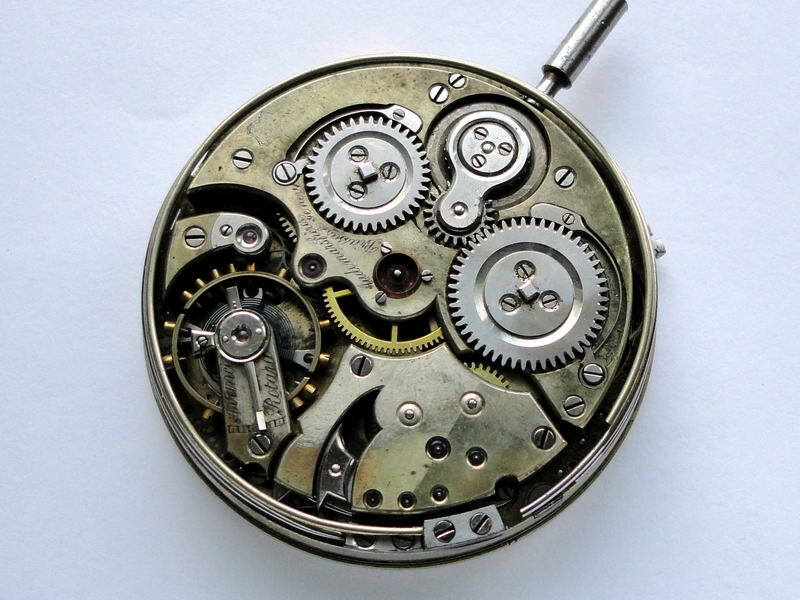 Under the dial is a system of springs and levers and also the “reduction regulator”, making the sound. On the outside there is a lever to turn the gong action off (top) and one for setting the time (right). 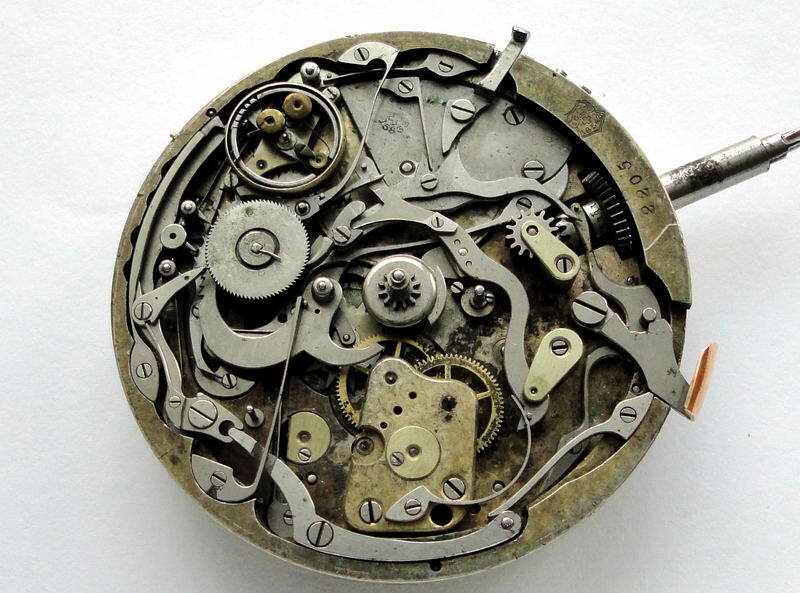 The movement dates back to 1880-1900 years, it was ‘hi-tech’ for its time, and really, still it is a pure technological wonder. 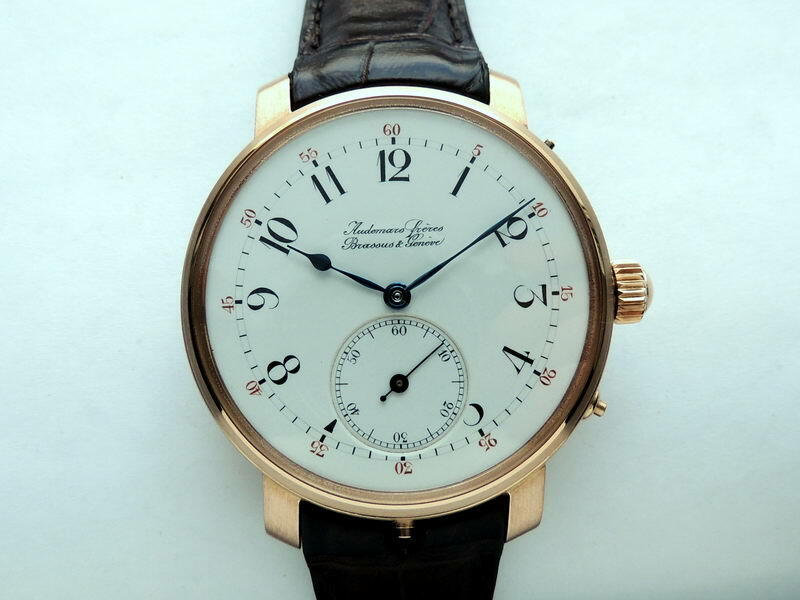 The brand Audemars Freres was one of the branches of Louis Audemars watch denasty, the other famous branch is called Audemars-Piguet and is well existing theese days on the world’s watch stage. 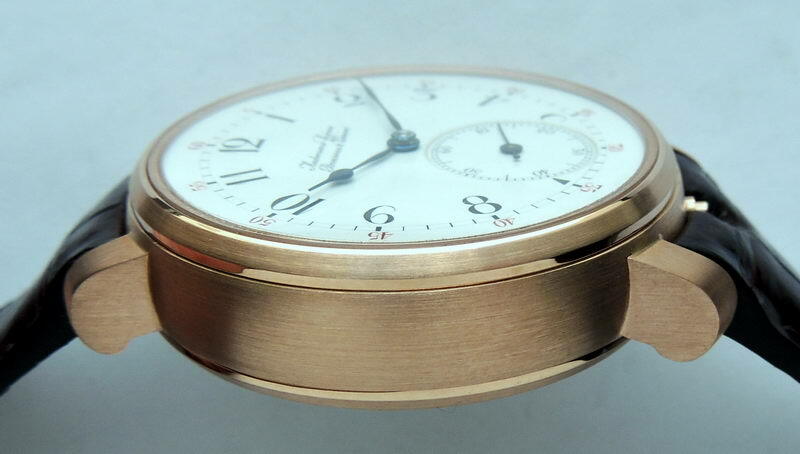 It’s obvious, that at the times this movement has been made, there were no hand watches, so it laid in a gold pocket watch case. 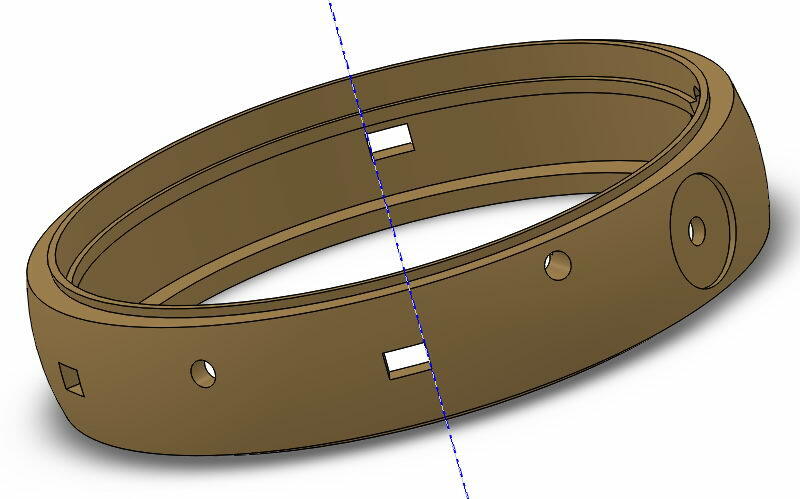 Now, it’s time to make a hand case, but in such a way, so that you cam literally wear it on your hand. As the main case theme, we chose to use the model Audemars Piguet “Jules Audemars Grande Sonnerie Carillon”, a pricy and rare piece, made in 2002. Having similar functions such as the quad-gong and carillon, it was perfect. 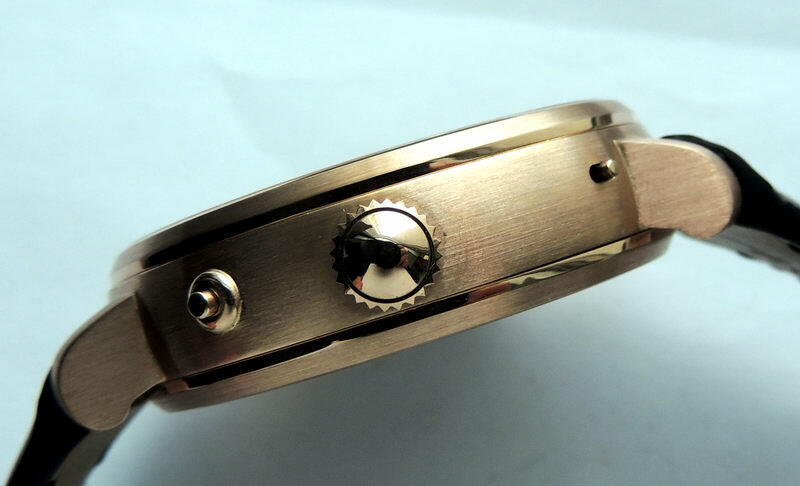 The diameter of the movement (by the dial) is 46,5 mm and the thickness about 14 mm. These sizes create actual restrictions, as our desired is a size is not too big, it needs to be ergonomic but look harmonic. The size of a modern movement from Audemars-Piguet is just different: it’s thiner, the watch is made to look elegant, with a flat thin bezel. If we were to simply proportionally increase the size of the piece, we would get a very large watch, and it would not be comfortable to wear. 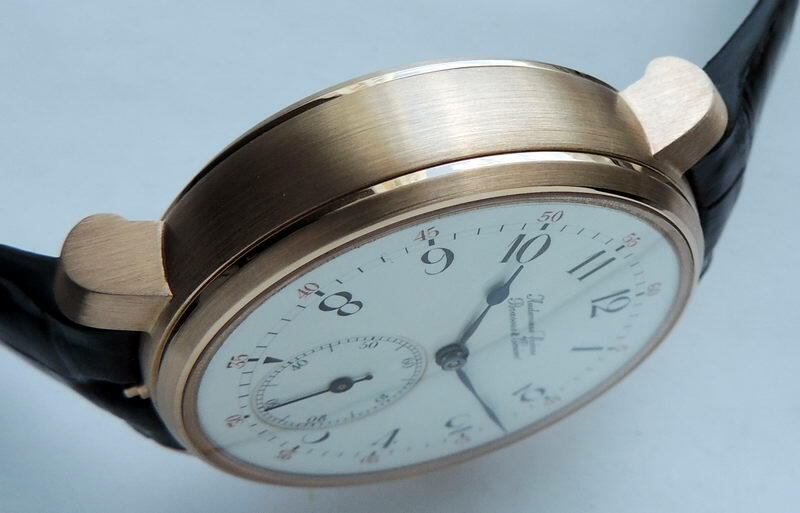 The hardest task is to ‘hide’ the thickness, to prevent the watch from feeling too large. We could go the easy way (horrible example 1, horrible example 2, viewer discretion may be advised :P), but it is way too bad, wearing this may make you feel ashamed. 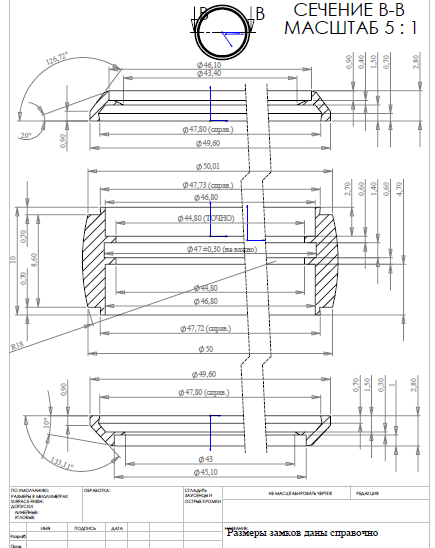 So, lets sit down and sketch a 3D CAD of a case bearing in mind the sizes of the movement we are dealing with. 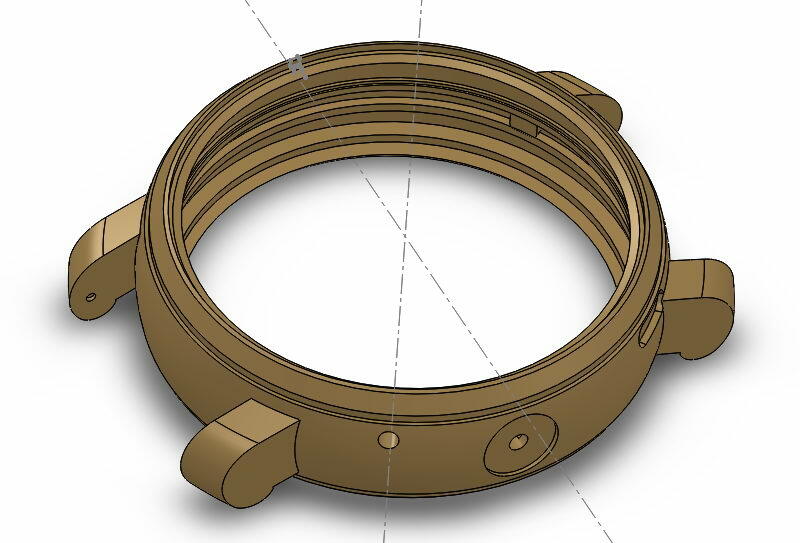 The watch will be thick, and this thickness will extend into the front and back bezels. We managed to fit ~2mm of thickness in each bezel, and we were left with 10mm in the centre – a very acceptable thickness. The central part of the case, the rectangular openings are for the lugs. The round holes are for the winding crown and levers/knobs. After adding the lugs and rants, we can observe the general proportions. The thickness is consumed by the top and bottom bezels, so we can then make the central part thinner. Finally, we make the blueprint for the router. 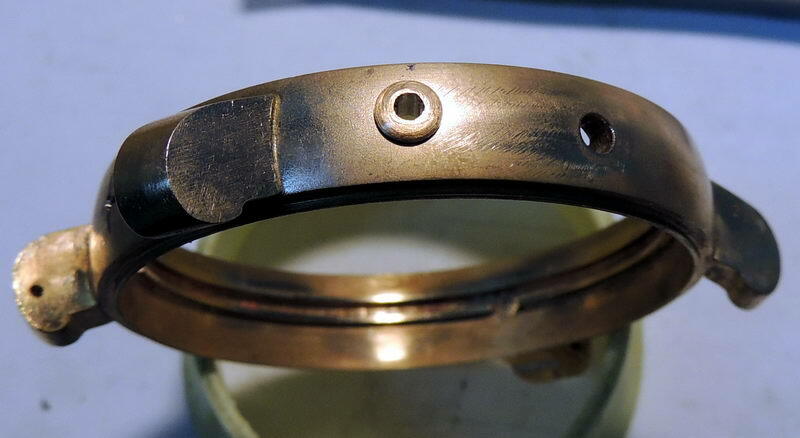 The large feature of this case is where the main toroid ‘donut’ part and the straight edges of the lugs come together. 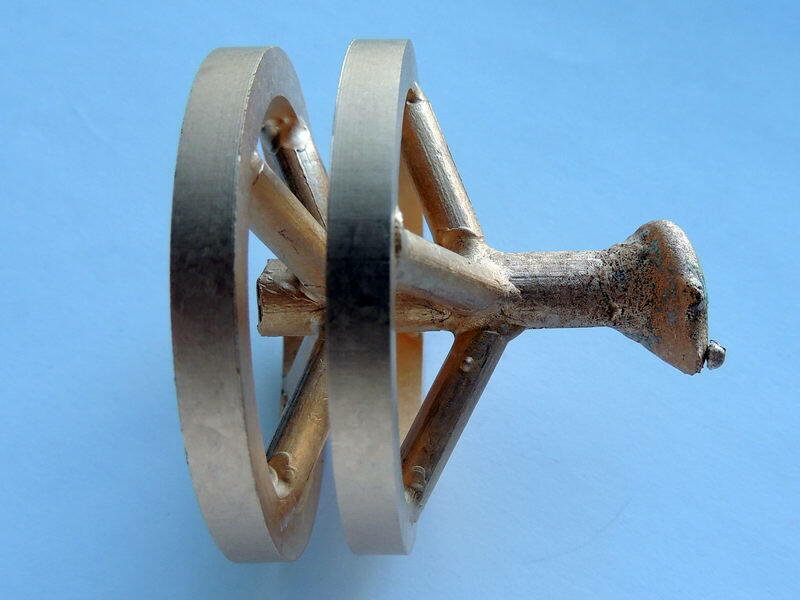 It is harder than it seems at first to make it, as casting will not produce a nice edge, and routing it will be impossible as the spindle will not reach into the corners. Finally, we decided to go with a modular case – we will make the lugs separately from the main body and later solder them together. Here, I need to mention that some stages of the production may have not been captured on camera because partly it was me forgetting, and partly because some photos were simply underexposed and bad. So, we will ignore the boring part of routing the case, and focus instead on the features of it. Fistly, we need to make metal castings. It is a very important step and we asked a specialist caster to create it for us. The point is, that he needs to make the metal very dense, without any pockets of air, bubbles and internal caverties and dirt/oxides. If during the routing we encounter all of the internal bubbles, pockets and holes, then the whole effort is going to become useless. Because of the importance of solid casting, we will cancel out thin walls, as in our case only thick parts and pieces can come out properly. The case comes in at 70 gramms, meanwhile we used 250-300 gramms of gold during the casting. The leftovers have been returned as ‘sawdust’, and were used in other parts further on: caps, knobs and the crown. 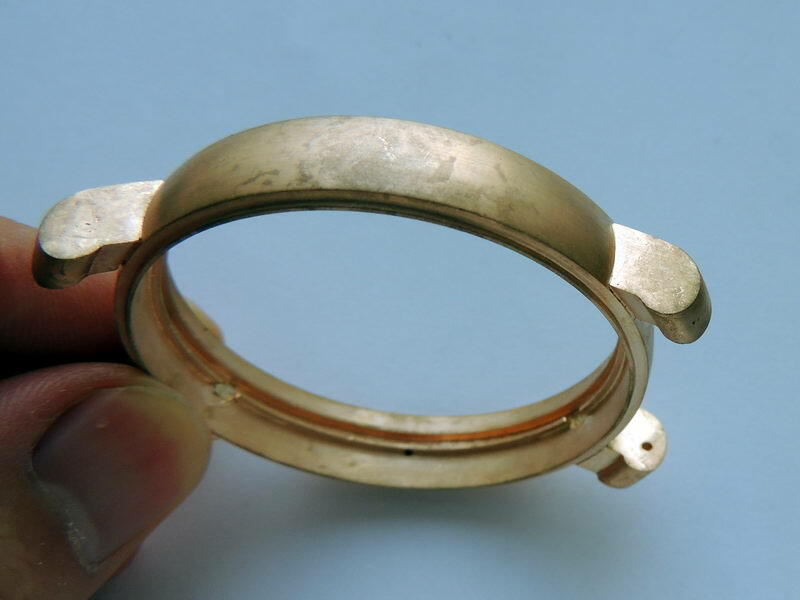 Because of the large tolerance margin of casting, extra material was used, and the casting totaled up to 3 – 5 times the gold of the finished pieces. 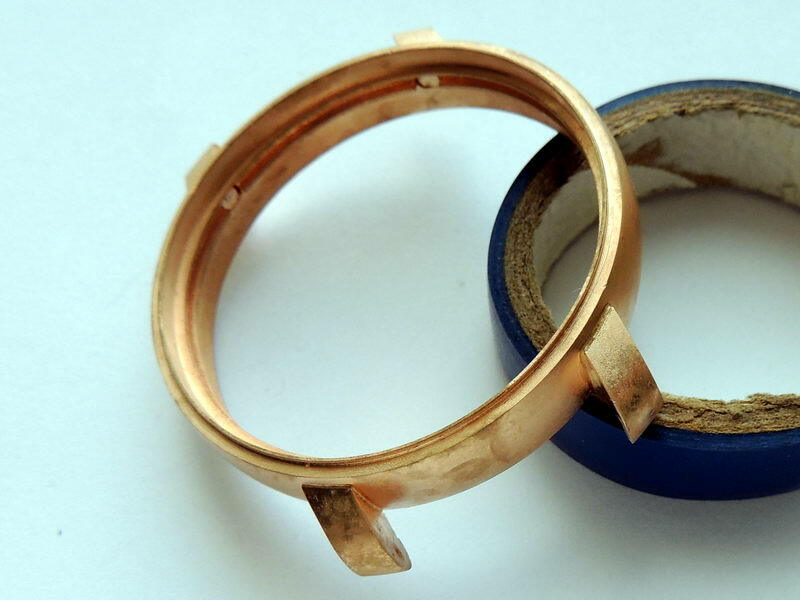 The lugs are a separate cast, they will be later soldered into the case. Their wax cast is based on a 3d model, printed on a special wax 3d printer. First comes in the router: it creates teh initial outside and inside forms. 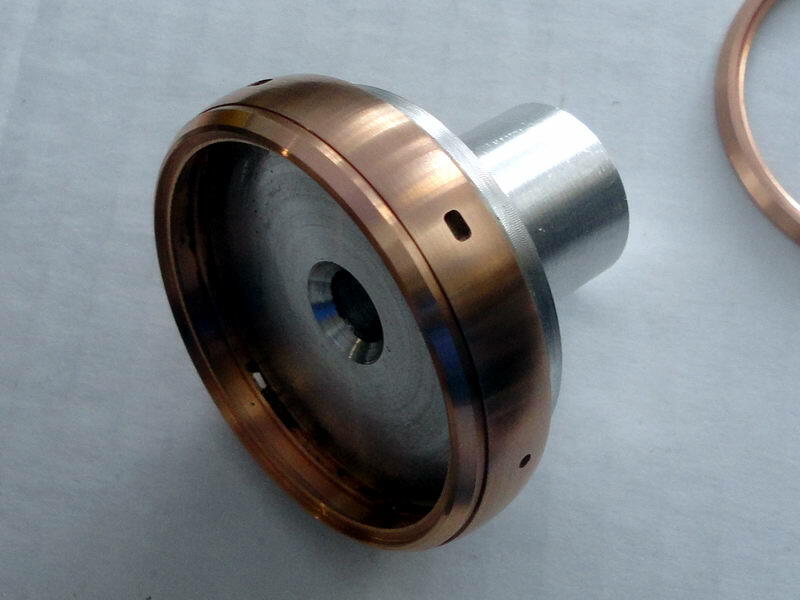 The inner surface is cylindrical, in order to allow us to hold it in a precision collet, which will let us route the outside shape. Next comes the interesting stuff – we need to turn the cyliner into a torus. 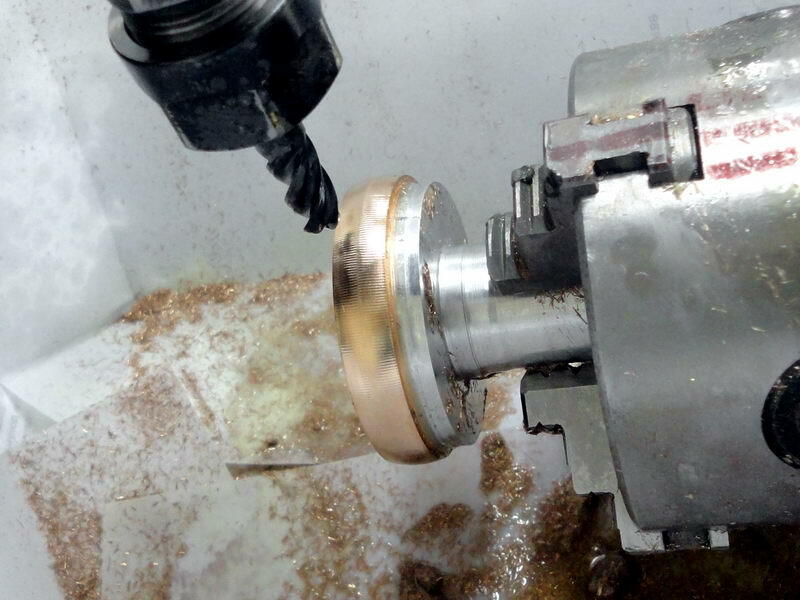 We will route the outside shape of the ‘donut’ on a 4-axis CAM, going back and forth with a round – tip drill bit, until the form is right. 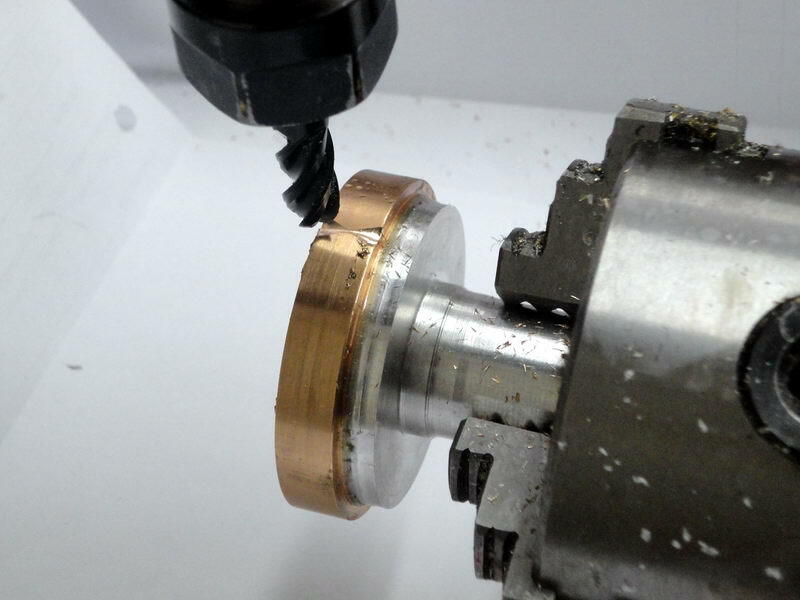 The drill bit mills away the metal, leaving behind the desired shape. The first round is done. We will then rotate it by 0.5 degrees, and do another round. The sawdust is all collected on a piece of paper. The surface gets a finishing touch with an abrasive tool for polishing metals, soon the surface turns into a shiny pink gold toroid. We route out rectangular holes in order to affix the lugs to the piece, and round apertures for the knobs and the crown. Now is a good time to test-fit the bezels, to see how they fit. The next stage is soldering the parts to each other. 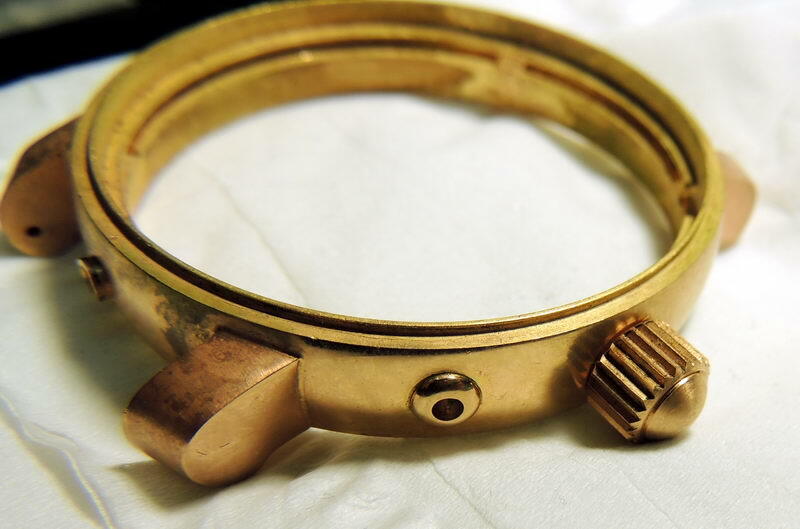 This is a work of a jeweller, we only provided some supports to fit the lugs exactly 24mm apart. 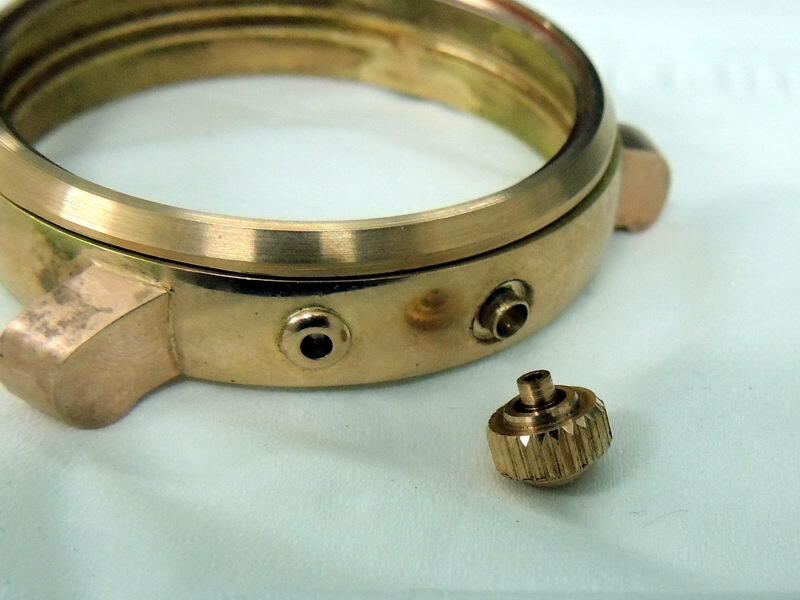 Each knob, lever and button looks natural on the watch, yet these parts have to be individually routed, brought to size and soldered with special gold sodler. The first join, before the final internal brazing. All of the satin is gone after the part was heated, the surfaces are smoothed down. The lugs are not soldered inside yet. We then cast blanks from the leftovers, and route the button cups. They need to then be adjusted to fit and finally affixed on the case. 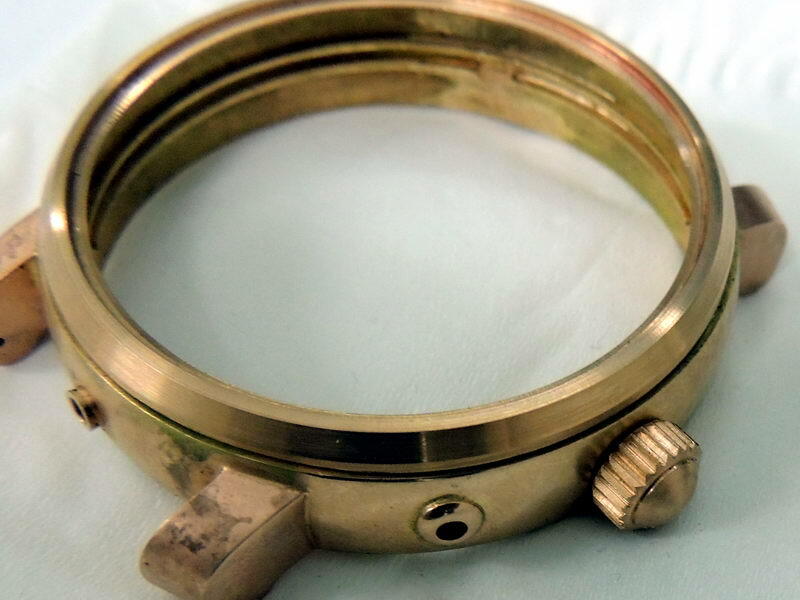 The winding crown did not come out great the first time, it resembled a radio adjustment knob. We had to get a working form, which was not easy. The knobs, lobs and the crown are complete. The case resembles a finished unit even more. We will make a footer under the crown, as this will prevent dust from entering the movement. After assembling and soldering together the parts came a tedious and hard job of finishing the looks. We have gone through lots of bad ideas, which just did not look good (no photos, sorry). Finally, we stoppen on a hybrid satin finish. 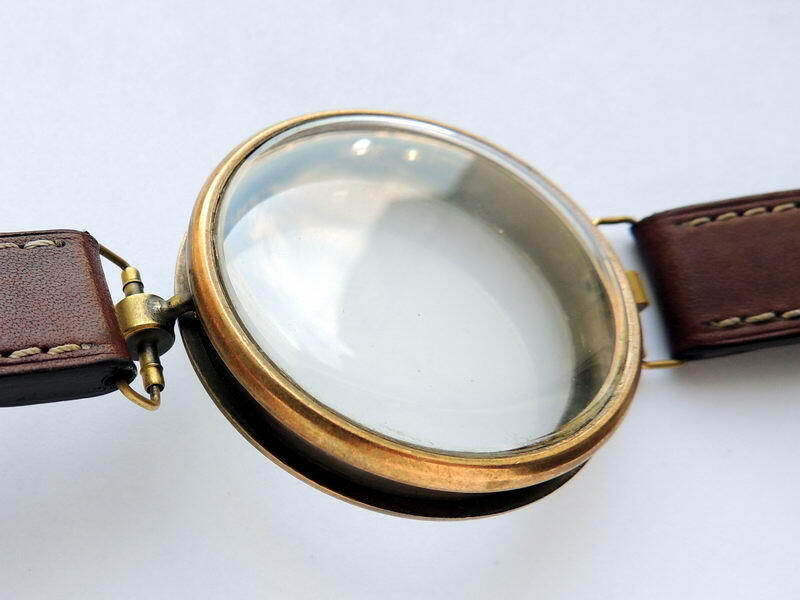 The satin along the sides was achieved using an abrasive steel sponge, it is combined with smooth edges of the bezels. 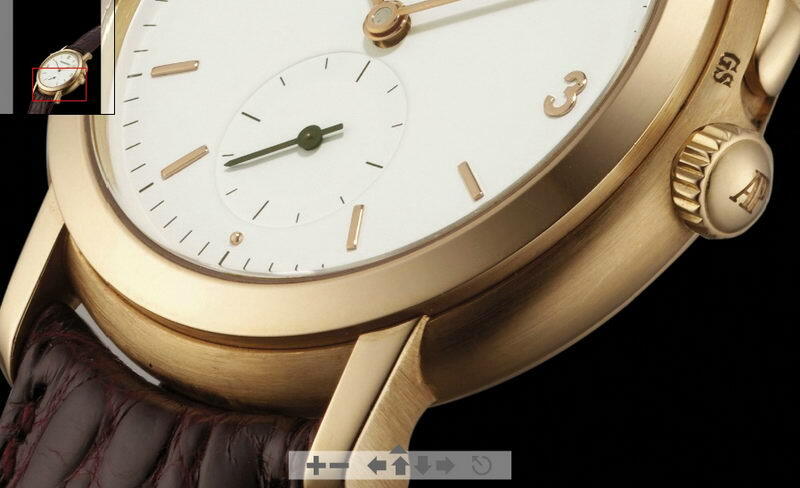 The central part is percieved as the thickness of the watch, and the shiny bezels as the edges with mirror chamfers. Horizontal lines create a feel of a thinner watch than the real case size. From left to right – time setting knob, winding wheel, gong toggle. The gong trigger was chosen to be minimalistic (like on an iphone), done to not accidentally overwhelm the design. 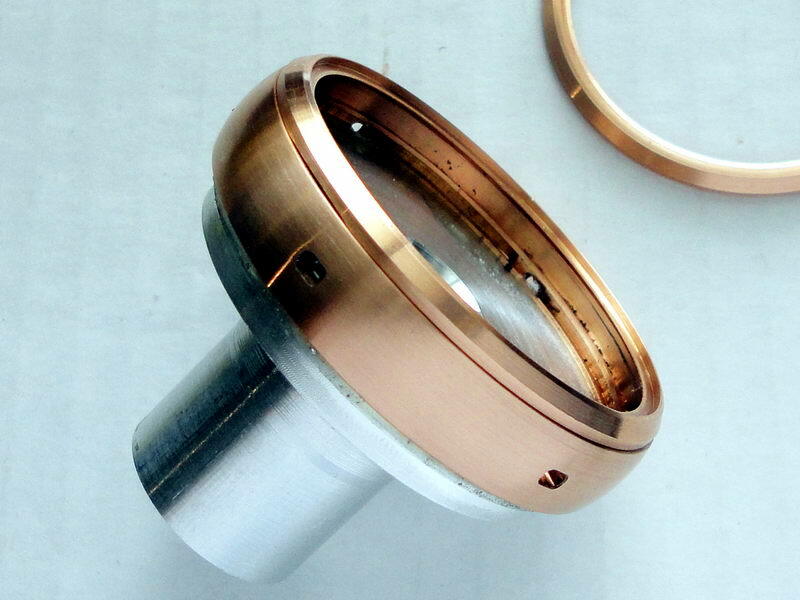 The satin polishing touches are also applied on the outside of the bezels, which will rub aghainst various surfaces. Minor hits and constant wear will show on a shiny surface, but will not ruin the linear pattern. The movement was dirty, but was soon restored, the surfaces glimmer in the light. We did not have to get it going well, but also take it apart and polish the parts. The movement was all untouched, except for two missing wheels. 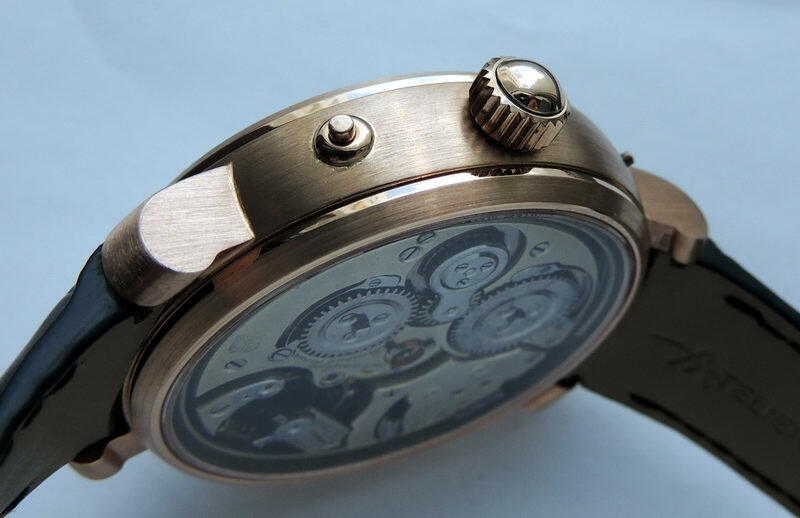 After sevicing and more fine adjustment the movement has the precision of a new one. In total, 12 people worked on this project, including casters, jewellers, glazers and others. Here is a good look at the result. The button on number 6 is responsible for the manual gong, which works as a quarter-repeater. Other niche features include sapphire crystal and a hand-crafted custom crocodile leather strap. 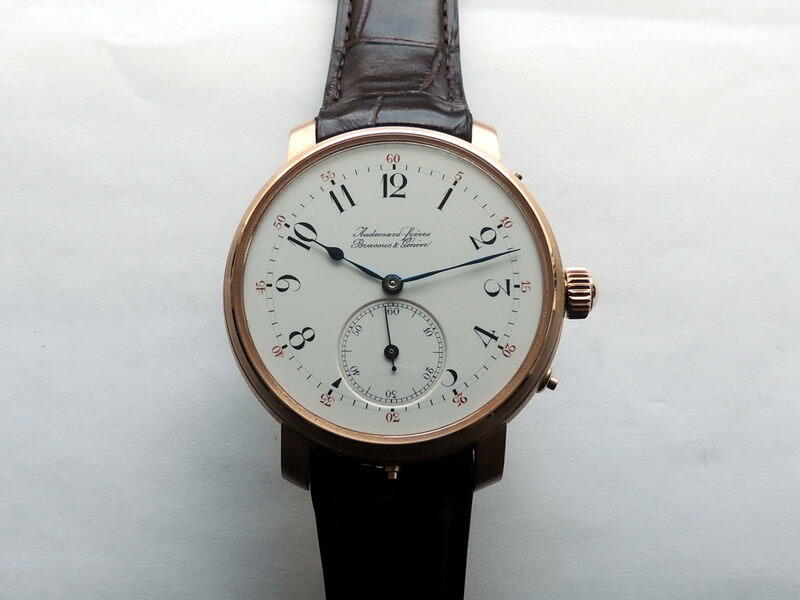 We say thanks to the watchmakers at Audemars Freres, whose efforts lived longer than their creators. A deserved movement was not lost, it once again pleases its owner with its prescision meanwhile having excellent, clear and beautiful sound.